Countless jobs require you to be bilingual in today’s international economy. Whether you’re in the medical profession, a journalist or in law enforcement, employers prefer to hire someone who is bilingual. Being bilingual not only makes you more appealing to employers, it can also get you a pay raise. But how can you learn a new language when you’ve got a full-time job? You probably don’t have time to go back to school. That’s where language learning softwares come in handy. In our Pimsleur Review we’ll discuss key components, pros, cons, pricing, customer reviews and our personal experience with the software. Pimsleur regularly runs promotions, click here to take advantage of the latest offer. We also have a Pimsleur coupon code page dedicated to time sensitive discounts. Pimsleur sent us the software to try in exchange for an honest review. We found that some team members liked while others didn’t enjoy as much, but it just comes down to a matter of preference. If you are more of a visual learner who likes seeing words and phrases, then this isn’t the best fit for you. However, if you prefer audio learning and like listening to podcasts, then this would be a good bet. Now that you’ve learned all the nitty gritty on Pimsleur, we’ll show you what other customers think of the product (besides us). We’ve collected a few reviews online and placed them here to show you the good and the bad. Also, if you’d like, you can see how they stack up against other language learning programs in our large comparison article. Only 20% of Americans are bilingual compared to 43% in most countries worldwide. We’re a little behind the eight ball but there’s no time like the present to start making up for that! Take the initiative today by learning a second language. The morning commute is a great way to chip away at it. Carol explains a bit more about how Pimsleur works in this short (1:20) video. What Other Options Are There Besides Pimsleur? 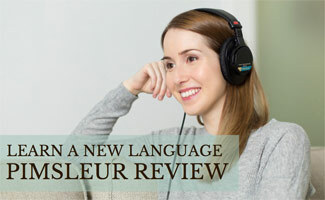 We hope our Pimsleur Review has helped you in your journey to learning a new language. Remember we’ve got a large language learning software review in which Pimsleur won the category for “Best Audio Learning.” You’ll find pros, cons, pricing, etc. for competing language learning software options that may be a better fit for your particular needs. Unlike you Kimberly, I am more of an independent learner and don’t have time to go to a classroom so Pimsleur might be what I’m looking for. Does digital mean I can play it on my iPhone? Wasn’t sure if the MP3s are compatible with smart phones so I can listen on the go? Pimsleur may be a great fit for you! The digital lessons can be played on your computer, tablet, iPod or smartphone, or you can get CDs to listen to. Let me know if you have any other questions!